In a similar way trees are the same way. They work 24/7 getting the water and nutrients from the soil around them. Nothing can work all day without taking a drink of water. Keeping your trees watered is the best thing you can do for your trees! What is the importance of watering your trees? Dieback of the crown of a tree, this is done to balance out the ratio of water the roots are absorbing to the leaves they have to feed. Growth of a tree in height and diameter, When you cut a tree down you can see the tree “rings”, this shows a diagram of how much water and nutrients the tree received in a growing season. The larger the ring the more nutrients the tree received and the more it grew that season, the smaller the ring the less nutrients. 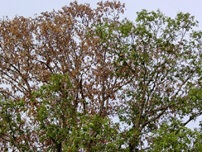 In extreme cases lack of water can result in the death of a tree. But I water my trees with my sprinkler system? To help balance out the extreme temperature changes the Mid-West can experience, mulch can be your friend. 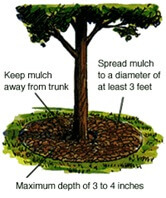 Here are some of the benefits of mulching your trees. You do have to remember not to pile the mulch around the base of the trunk though, as this will promote rot in the base of the tree.